Archbishop Desmond Tutu on Wednesday passed wide-ranging criticisms of President Jacob Zuma and his administration. 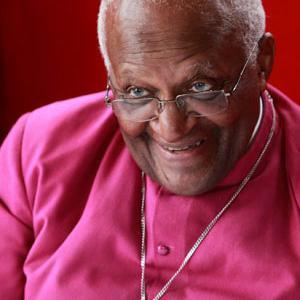 Delivering the annual Desmond Tutu Ecumenical Lecture at the University of the Western Cape, the former cleric, who turns 80 later this year, strayed far in his speech from the strict definition of ecumenical. "I am very fond of President Zuma. He is affable and warm. But I do believe it would have been better for him to have been pronounced innocent by a court of law weighing the evidence, rather than through a dubious administrative act," Tutu told his audience. He then turned his attention to South Africa's controversial arms deal. "And, if indeed there is nothing to hide, the government surely has nothing to fear from a judicial commission of inquiry into the arms deal. It is an unnecessary albatross to carry the huge doubts." On corruption, he warned the country was being dragged backwards. "Our country, with such tremendous potential, is going to be dragged backwards and downwards by corruption, which, in some instances, is quite blatant." Tutu criticised Zuma's relationship with Schabir Shaik and the Gupta family. "It may be that there is nothing to worry about with the parole of [Schabir] Shaik, but it must raise eyebrows when someone who was said to be at death's door is shown playing golf. It is worrying when his close relationship to the president is put in juxtaposition. "Perhaps the Gupta family would make all those lucrative deals and it is merely coincidental that the president's son is a beneficiary." He described these relationships as worrisome. "It may all be above board, but it is worrisome. I am sure it is all in order, but it is disturbing that there are these seeming coincidences." Tutu called for a return to a constituency-based electoral system. "I think the party lists for selecting our representatives have served their very important purpose of ensuring representation for every conceivable grouping in the transition years. "But we really do not want kow-towing sycophantic voting figures who are always ready to change their principles in order to stay on those party lists. "We must revert to the well-tried constituency system," Tutu said. Tutu also took a swipe at last December's National Youth Development Agency-organised international youth festival, which came with a whopping price tag. "I must say I would need a lot of convincing to show that an expense of over R100-million for a youth rally of very questionable taste and intellectual worth was money well spent in the face of so much poverty, unemployment [and] homelessness." He then noted that the political events that have and still are unfolding in North Africa should remind governments everywhere that people were not fools. "One day they will call rulers to account." Speaking earlier to journalists, Tutu said he was "very deeply disturbed" about the ongoing violence in Libya. Asked what he thought should be done to stop it, he suggested international intervention was necessary. "When government is unable or unwilling, then the international community should intervene." Asked if he favoured a so-called "no-fly zone" over areas of Libya -- a step being considered by several Western countries -- he responded: "I hope they do all they can to stop the carnage." Tutu also said the South African government should use its "warm relationship" with Libyan leader Muammar Gaddafi to influence what was happening. "Use it to say: 'Please, restrain yourself'." Asked about the recent furore over race, stemming from remarks made last year by then labour director-general but now national government spokesperson Jimmy Manyi, Tutu said he was "trying not to get involved". However, it was "strange that something said a year ago should come up ... as if it's a put-up job". He further noted that 17 years into democracy, "we have fallen down in quite a few areas". In his address later, Tutu also noted there were many competent South African who were being sidelined because they were not politically aligned with the ruling party. "We have many very competent people in this country; people of all races; people who would be snapped up in other countries; people who love this country passionately; people who were involved in the struggle; people who are today being sidelined because the first qualification is not ability, not calibre, but political affiliation." He earlier told his audience he had many times wished he could be more circumspect in what he said, "but it has not been possible ... all my utterances are inspired, driven by the love of God, and a passionate love for my country and for my compatriots". It was for this reason he had condemned "the pernicious Aids policies of a previous administration". Tutu's received a standing ovation on Wednesday after his address, which he described as "the musings of a decrepit". With acknowledgements to Richard Davies and Mail and Guardian.